Starting at only $1500, the Sport EX puts a Primary Flight Display EFIS in your panel at an unbeatable price. Software options let you purchase what you need now, and expand later, without removing the EX from your panel. Built on more than two decades of avionics experience, and using the industry’s only AHRS that can operate unaided, the base model provides primary flight functions and engine pages which can be driven by any GRT EIS engine monitor. 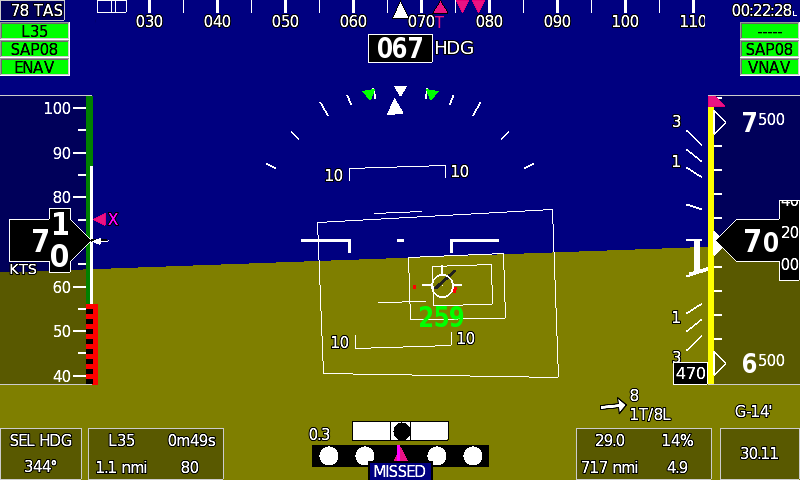 The base model even includes synthetic approach to any runway, and depiction of obstacles on the PFD screen. The optional synthetic vision, with its 10 mile range, provides intuitive terrain awareness. This awareness is essential whey flying in mountainous areas, and also creates a natural sense of height above the ground, location, and direction of flight. 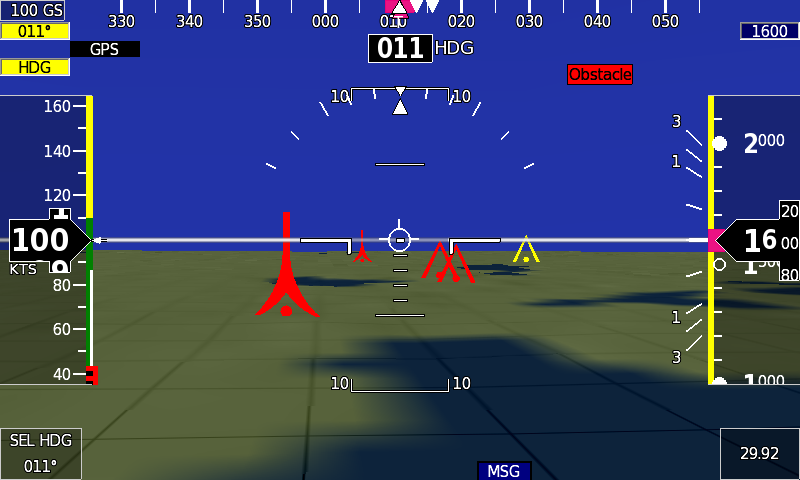 3-D way-points, obstacles and runways, make navigation simple and help protect you from the threat of towers. 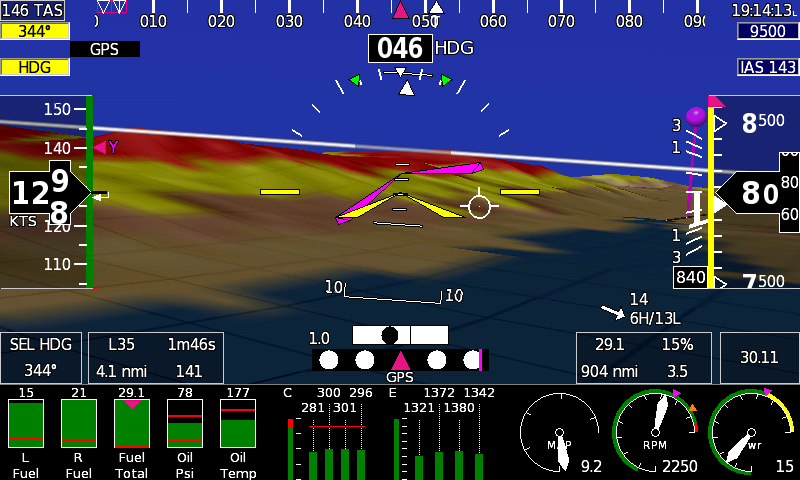 Ten split-screen combinations are included, combining two or three views into one screen of the PFD, map and HSI, and engine monitoring. Information is clearly presented, making it practical to fly with a single screen and rarely touch a button. For dual screen installations the split-screens provide a single-screen reversionary mode suitable for IFR flight. Dual screens were never an after-thought. The Sport EX was designed to function together, providing more information, interfacing and redundancy. Illustrated below are two screens configured for takeoff. We like displaying the EGT time history for takeoff. It allows for differentiating between engine problems affecting a single cylinder, and those affecting the entire engine-potentially valuable data for making critical decisions. Below two Sports as they are configured after initial climb-out. The map now replaces the engine page, and the engine strip is shown on one of the screens. Either screen could show the engine strip. 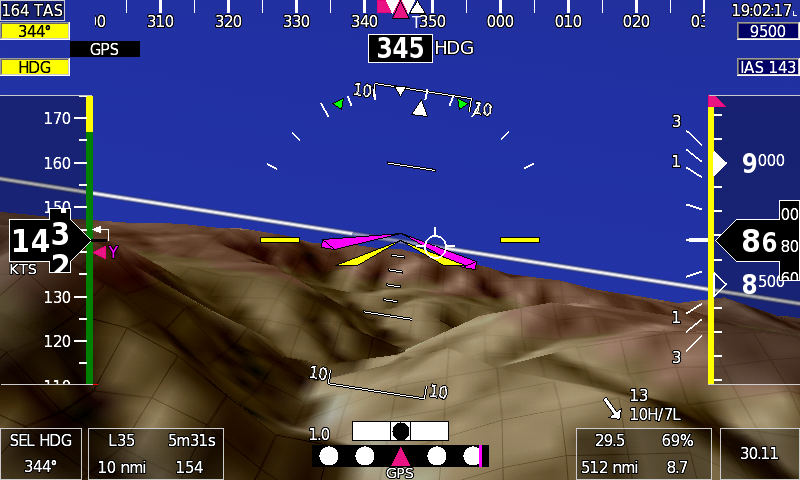 The PFD has the terrain mode turned on. Choosing the screen is one button push away. Often the days we fly do not require constant monitoring of the airplanes attitude. Airspeed, altimeter, and a map are all we need, with the PFD attitude to back us up if conditions change. We love those days and so does the Sport EX. That is why we allow you to show airspeed and altimeter tapes on your moving map. The Sport EX rounds everything out with wind and destination information. The green arc shows where the airplane will be when it reaches a pre-selected altitude (ground level in this case). Extended centerlines make it easy to line up on the correct runway, and is essential at night. The greatest value of obstacle alerting occurs when you find yourself forced to fly under an overcast in less than desirable visibility. At times like this, it must be effortless to understand such threats. That is why we show your threats on the PFD and not just the map. We show you the threat in the exact place you will be looking-the PFD. They appear in the same location out the window as they appear on the screen. Simple, and potentially life saving. Shown here with the synthetic vision option, but also without this option (lower right). Deferring synthetic vision does not mean you are sacrificing situational awareness. The Sport EX shows obstacles and runways on the screen as they appear out the window, even without the synthetic vision. The highway-in-the-sky guidance for the synthetic approach still delivers the sense of reality necessary to make any approach easier and more precise. Include the ADS-B Option, and the Sport EX is ready to GRT EIS to display weather and traffic from a large variety of ADS-B receivers, including the popular Stratux/Raspberry Pi based receivers. 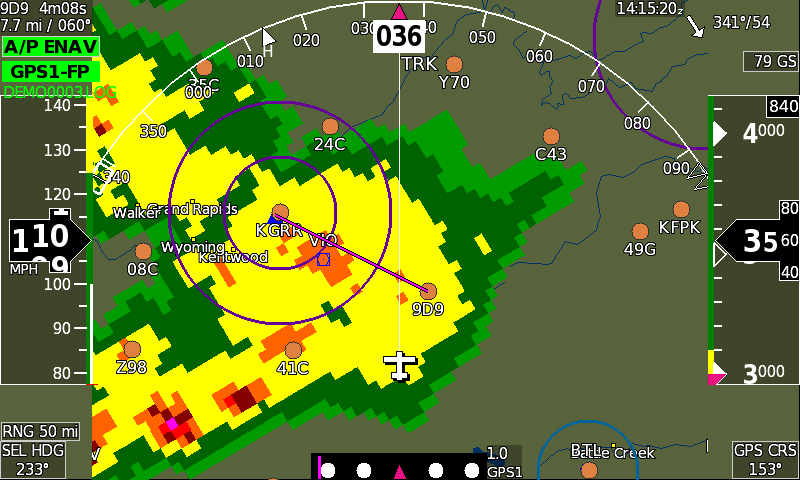 Weather displays include weather radar overlay, as well as metars, temporary flight restrictions, and other weather functions as they become part of the ADS-B system. Traffic, with voice alerts, is displayed on the map, and on the primary flight display, just as the airplane appears out the window. Angle-of-attack sensing is now available on the Sport EX. Sensing is via a two-port 45 degree pitot tube, such as those commonly available from a variety of manufacturers, or using a probe fashioned by the builder. This method has no moving parts, and allows the use of heated pitot tubes that preserve the stall warning function even in the presence of icing. The GRT Avionics AOA function drives on-screen AOA symbology that shows too fast/too slow/optimal approach speeds, as well as stall warning. An audio output provides an approaching stall warning annunciation (a pulsating tone that varies with proximity to the stall warning angle) and a solid tone indicating stall is imminent. Connecting any GRT EIS to the EX provides you with comprehensive engine monitoring, but you can start simpler with the Basic Engine Monitoring Option. This low-priced option includes the sensors to provide oil pressure, oil temperature, tachometer, hourmeter and flight timer, which wire directly to the Sport EX. 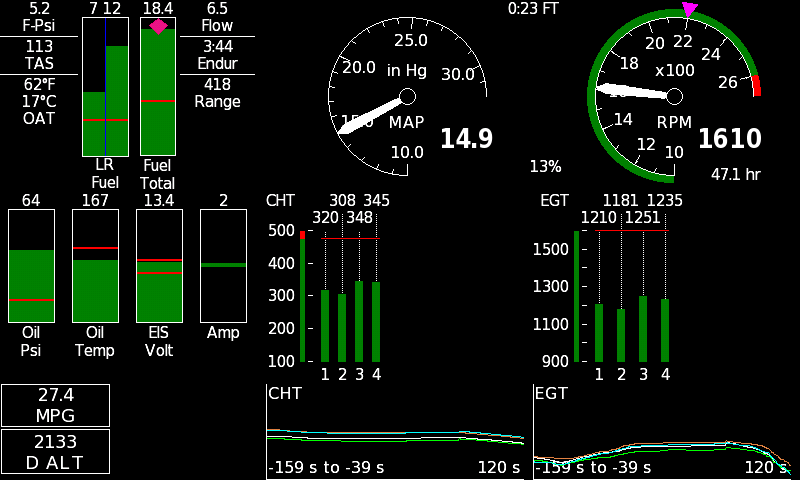 The engine data appears on split-screens, and the full graphical engine monitor pages. Later, when you choose to upgrade to an EIS, the sensors are also usable with the EIS, reducing the upgrade cost. Having produced the EIS engine monitor for over 20 years, we’ve accumulated a great deal of personal and customer engine monitoring experience. From this came such exclusive features as the exhaust gas temperature (EGT) time history. A simple graph of the last two minutes of all EGTs, our engine monitoring system makes it effortless to distinguish between engine problems affecting one cylinder, or the entire engine. This distinction could be essential when making decisions in response to engine problems, especially at critical times such as initial climb out. We find it so useful that we never takeoff without it displayed, and we recommend you don’t either. CHT time history also proves useful by making the trend obvious. This is especially useful in high-performance airplanes, such as RV’s, Lancairs, and all pushers, where engine cooling can require some pilot technique to manage. It leaves no doubt which way temperatures are headed. Finally, we love the specific fuel consumption display. Its measure of engine efficiency that confirms when you have leaned properly, and tells you when you need to lean again. 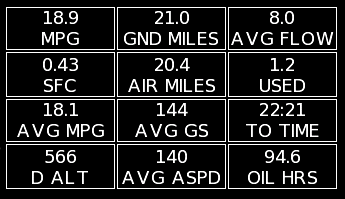 Engine data is provided to the Sport EX via the Engine Information System (EIS). The EIS is a complete instrument with a display and user-interface. 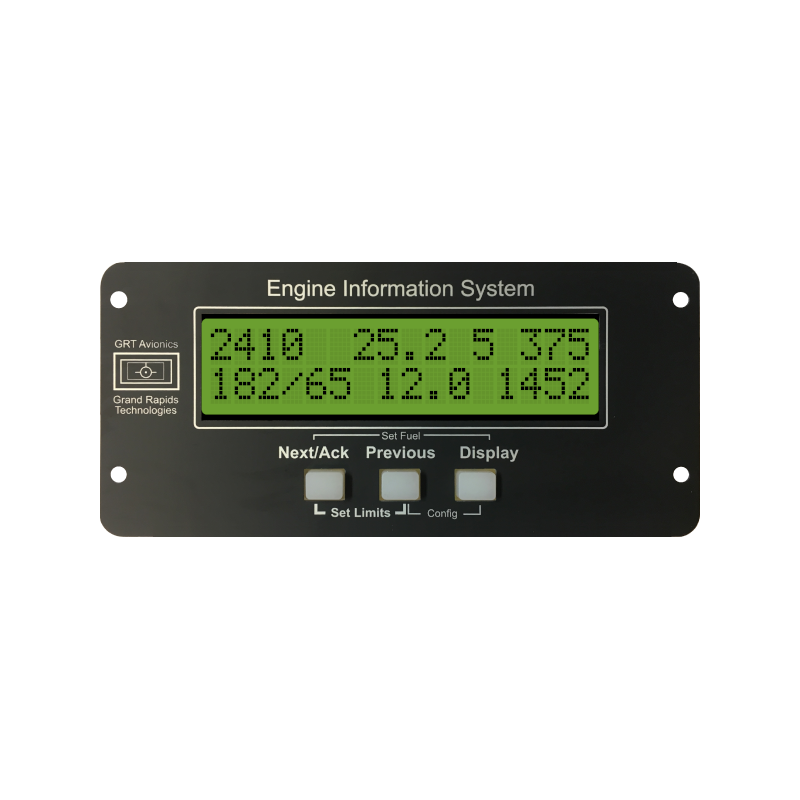 It may be remotely mounted, just like any data collection device, but it can also be mounted in the instrument panel as a primary or backup display of engine data. In tandem seating airplanes it can be used as an instrument for the rear seat. Engine limits can be set in the EIS and can be used to drive its own warning light, even when remotely mounted. Have room in your panel? We recommend you mount it there. You will come to appreciate this time-honored engine monitoring instrument, even if it isn’t as colorful as our EFIS. Dual rotary knobs and 5 lighted softkeys make up the pilot interface. All are high tactile force, which is optimal for operation in turbulence. Pilots upgrading an older Horizon WS screen will find the user-interface practically unchanged. Primary knob functions are heading selection and baroset. Pressing any softkey brings up secondary knob functions and softkey labels. Simple, effective and efficient. 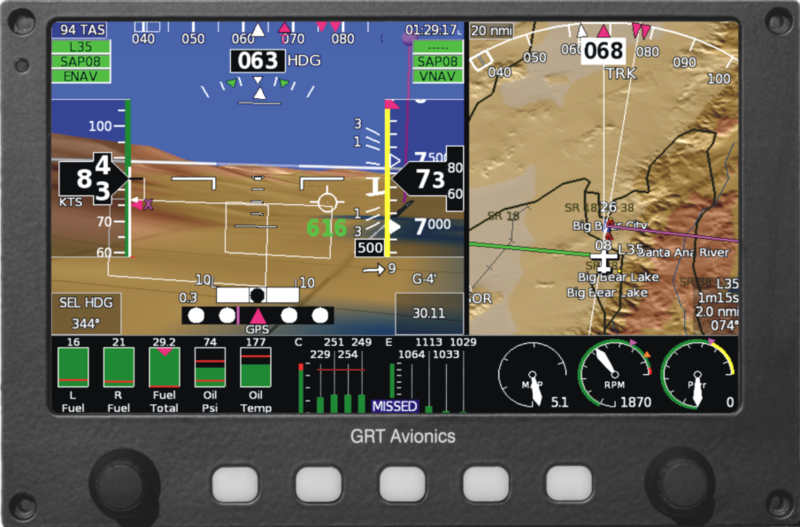 GRT Safe-Touch – Your PFD is now an Autopilot Mode Control Panel! GRT Safe-touch option provides touch screen interaction without the risk of inadvertent activation. We use the simplicity of the touch screen for making selections, such as choosing the leg of the flight plan to be modified, with the positive action of a softkey press before activating the selection. Simple and secure, even in turbulence, nothing happens until you confirm or cancel and touch screen edits with a softkey press. 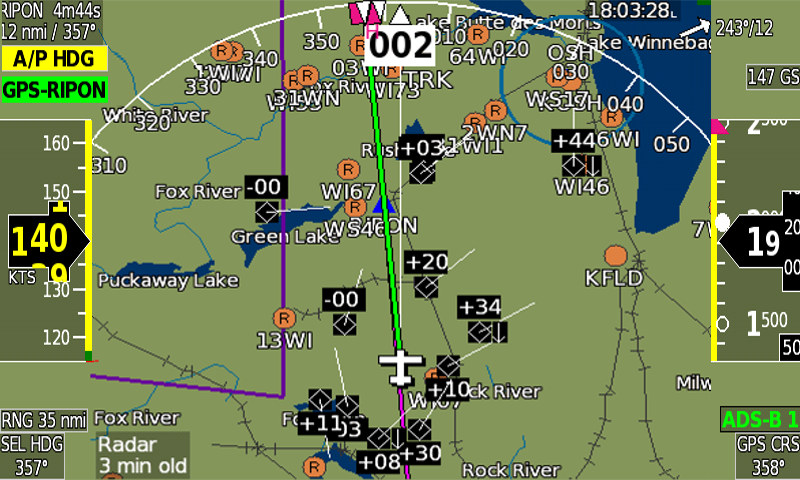 Shortcut to setting of autopilot airspeed/vertical speed/altitude targets. 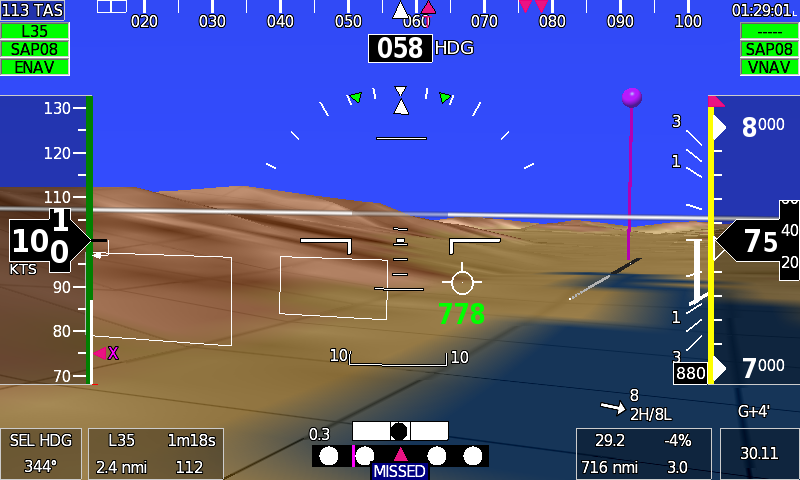 Just touch the airspeed/altimeter, or vertical speed display and select the target with the knob. 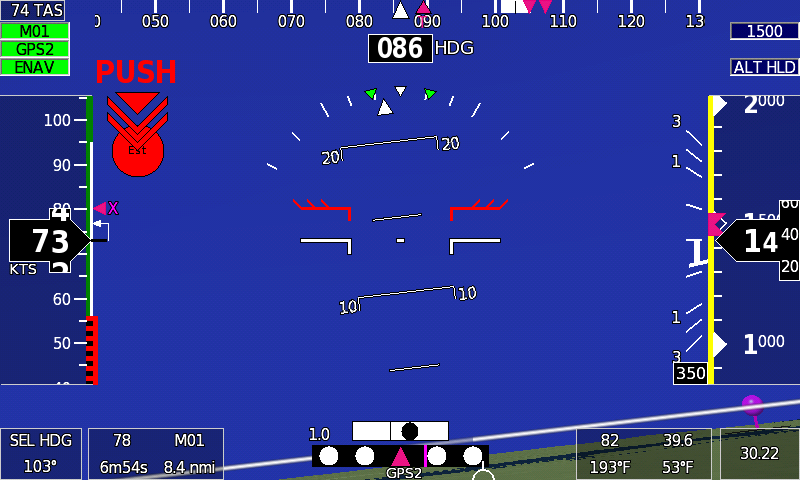 Your PFD becomes an autopilot mode control panel. 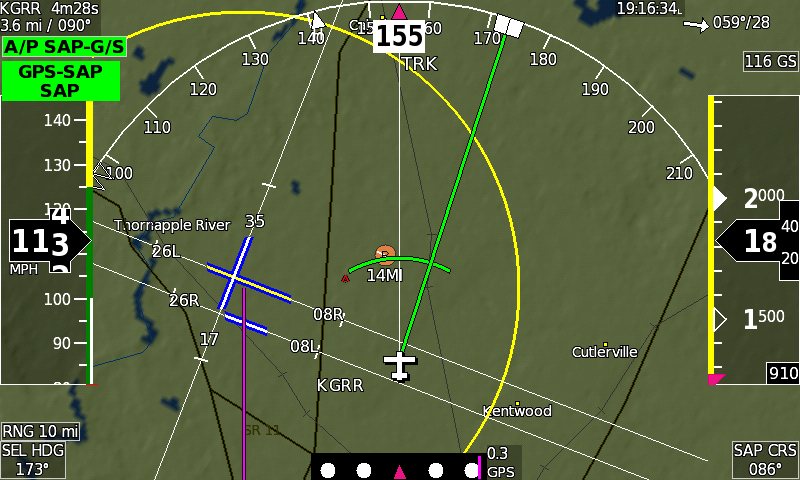 Flight plan editing, including moving, deleting, and inserting waypoints. The integrity of an EFIS is dependent on the integrity of the attitude data that drives it. GRT Avionics has always lead the way with the only AHRS in the industry that can operate without airspeed or GPS aiding. The same adaptive AHRS that is used in our stand-alone AHRS, is built into the Sport EX. Read more about the latest generation of AHRS technology here. Three serial ports in and out (optional with six), a USB port, and a dedicated magnetometer port, allow for great flexibility within your panel design. An optional ARINC 429 interface can also be added, while still retaining all serial ports, for connectivity with IFR GPS navigators, such as the G430/650/750. The Sport EX includes autopilot functionality. Just add GRT servos and you are on your way to a fully automated cockpit. Like our GRT EFIS systems, it can also control an external autopilot. Even without servos, all autopilot functions are available to drive the flight director, giving you a single cue to follow, making you the autopilot, and simplifying hand flying while improving accuracy. Read more here. Already own an autopilot? Just wire it to the Sport EX, and the Sport will couple it to all your navigation sources! 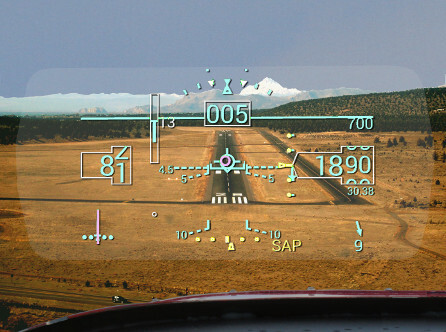 A heads up display can now be part your your GRT Avionics equipped airplane for as little as $300. Our pursuit of heads up display technology has led to support for the Hudly automotive after-market heads up display. 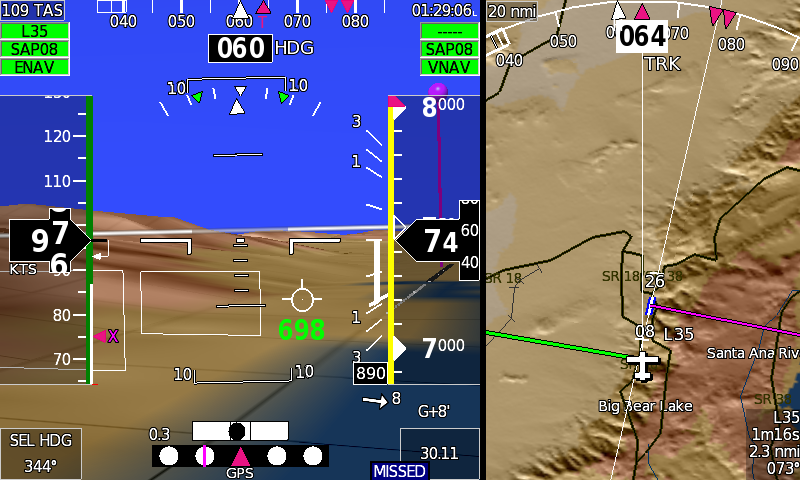 Graphics optimizations in the GRT remote app, combined with the impressive readability and value of the Hudly have resulted in the first practical heads up display for experimental and general aviation (certified) airplanes.